For LME Gateway 7.18, this section lists the parameters that must be set to establish and maintain the Order and Fill Server connection to the exchange. Sets the ISO Country Code to identify the location of the person making the investment decision. Sent to the exchange as Tag 10048. This is a required parameter. 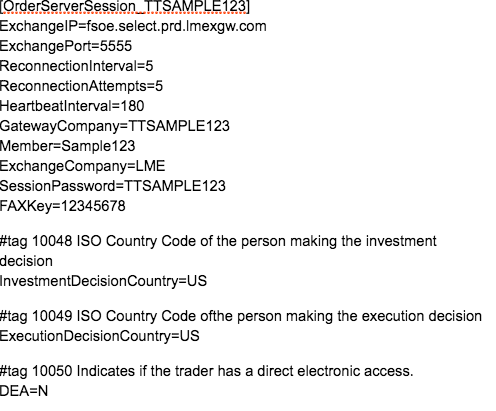 Sets the ISO Country Code to identify the location of the person making the execution decision. Sent to the exchange as Tag 10049. This is a required parameter. Indicates if the user has direct electronic access. Valid values are "Y" (user has direct electronic access) or "N" (user does not). Sent to the exchange as Tag 10050. This is a required parameter. Sets the type of trading capacity. Valid values are: DEAL (dealing on own account), MTCH (matched principal), or AOTC (any other capacity). Sent to the exchange as Tag 10051. Sets a user-defined client identifier. Enter a value up to 40 characters in length. Sent to the exchange as Tag 448. Sets a user-defined customer account identifier. Sets the unique ID of the trader or algo making the investment decision. Enter a user-defined value up to 40 characters. Sent to the exchange as Tag 452 (Party Role) = 300. Sets the identity of the user making the order execution decision. Enter a unique ID of the trader or algo executing the order. Enter a user-defined value up to 40 characters. Sent to the exchange as Tag 452 (Party Role) = 301. Sets whether the order was placed by a person or algo. Enter a trader ID or algo ID up to 40 characters.